Attaching transducer to transom with epoxy? I had a real leaky jon boat with a bad transom. I suppose I now have a phobia against putting any holes in the transom of my 13' fiberglass tri-hull. I do want a fish finder and want to mount the transducer on the transom. I don't want to use the trolling motor as a mount and I don't want to mount it inside the hull since I want the temp reading. Does anyone know if marine epoxy will hold the transducer mount on the transom? Is this possible at all? 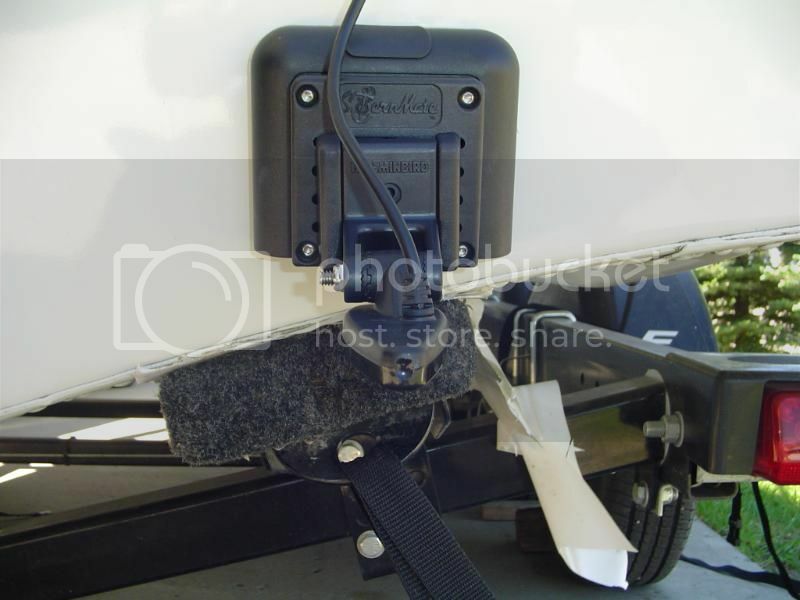 Re: Attaching transducer to transom with epoxy? Pick up a cheap poly cutting board from walmart or somewhere else. Cut two, 2"x 2" squares (or whatever size square will marry up with the outline of your tranducer mount) and stack them together. Glue the two pieces together with the epoxy and then use the SS screws which came with the transducer mount to screw the mount into the poly board stack you made. Then roughen up the mating surface of the poly board along with the gel coat on the transom where you intend to mount the transducer. I then took a grinder and made a bunch of cuts in the mating surface of the poly board, about an 1" long by a 1/16" of an inch wide, to give the epoxy a better bonding surface vs a perfectly smooth surface with no depth. Glue the whole thing onto the transom and give it several days to bond! There are also commercial glue on mounts you can buy but they seem to be based on the same idea as above. I dislike holes in the transom as much as anybody. They are potential leak and or rot starters, but the following method guarentees no water intrusion. Drill 1/2" holes about 1" deep into the transom centered on where the screws would go into the transom. Mix up some epoxy PB (epoxy plus cabosil or woodflour or microballons) and fill the holes you just drilled. Filling the holes from the inside out with a empty caulk tube filled with your PB works best. Screw the transducer into the PB using 3/4 inch long screws and you are done. If there is an award for over engineering an electrical system on a small single engine outboard boat, you win hands down. Got some negative feedback, but, still holding strong. Allows removal for re-positioning if needed. On my little tinny I mounted the transducer without more holes in the transom. This was my solution, an old piece of drawer slide material cut to fit. Mounts with one bolt at the top of the transom in an existing hole. Very sturdy and will not move, I tried. A Smart Phone is one that is Not in your hand when driving! If you mount the ducer plate properly with 5200 ( I prefer the fast cure 5200 ) I doubt you would have any problems. Here is how I would do it without the epoxy mounting. 1. Install the ducer Dry ( without any 5200 ). 2. Tape the transom around the plate. 4. Prep the area inside the tape lines with a scotch bright or 180(ish) sand paper. 5. Prep the ducer plate the same way. Give a few scrubs across where the screw holes are on the outside. 6. Acetone wipe both surfaces. 7. Apply a dab of 5200 FC on each hole. 9. Hand Mount your ducer with a screwdriver .. only semi hand tight ! ( dont crank it down all the way ). 10. Clean up the gooshed 5200 with a flat head screwdriver. 12. Clean up any residual 5200 with a quick wipe of a dry rag .. then clean up the rest with a damp mineral spirit rag. Dont get too nutso cleaning up around the screw heads. Now you have one of the best mounting gaskets. Some make the mistake of tightening the screws all the way down basically leaving No caulk between the two surfaces. I see the Theory of Auger01s post. But without proper beading its still going to fail. Sure the screws/holes cant come in contact with the wood .. but the epoxy holes can. If your still worried about screws into your transom .. then the best bet would be to lam glass a block of solid glass and epoxy that to your transom .. then mount the ducer to that. Just get some wax paper .. cut up some mat and 1708 or woving roving. Wet out and roll till you you build up 3/4" of solid glass. Cut/sand that for your mounting plate. We used to make solid backing plates from left over resin/glass on the side. Basically if you had extra glass and resin about to kick .. you goto the Plate and use the left overs creating a 3/4" solid glass plate ( cut a section out when you need it ). I used a Stern Mate mount kit on my new boat. Its glued on with the adhesive it comes with and the transducer bolts the mount. It works great and allows to reposition as needed. And I am with you on not wanted to drill more holes than needed. If done correctly, the epoxy should bond with the fiberglass skin of the transom and keep the water out. Most transom skins are at least 3/16 thick and that is penty of glass for the expoxy to bond to. I agree that glueing a block to the transom and then scewing the unit to that is the most bulletproof option, but it may not be asthetically pleasing to some. If done correctly, the epoxy should bond with the fiberglass skin of the transom and keep the water out. Most transom skins are at least 3/16 thick and that is plenty of glass for the epoxy to bond to. I agree that gluing a block to the transom and then screwing the unit to that is the most bulletproof option, but it may not be aesthetically pleasing to some. I'd say that your method would be very likely to crack and leak... I would think that simply sealing screw holes with 5200 would be much safer. But, where are the reevets? 1992 Hotsports Jet'n'Cat Yam 701 WR3 drivetrain "SS George Washington"
Why not just install it inboard? I got tired of them getting damaged by water sports activities and fishing in timber. Moved inside ever sense and haven't looked back. Lots of how do do it on here. If you are new to boating or have a new boat, a knowledgeable friend could show you how to operate your boat and save you a lot of grief, maybe some money, and maybe your life. I agree with avoiding holes but also nothing on a boat lasts forever, so gluing equipment directly to the boat, or permanently gluing in screws, with inevitably give you problems down the road. Mounting a plate and then screwing into it is the best way. Cheap cutting boardes eventually crack. I'd prefer wood over that, unless you have some starboard. remember wood doesn't rot because it gets wet; it rots if it stays wet. And if it does rot after 8-10 years, it's not a problem. A man of constant boat tinkering. Mark......I thought of that but I do want to have the temp reading. Thanks! You are suggesting putting a large hole for a few #8 screws. Yes the screws will hold into the epoxy .. but the epoxy will not keep out the water. Drilling 1/2" epoxy filled screw bases will not keep out H2O .. it only makes the diameter larger for H2O to get in. Yes .. bedding through hull fittings and screw holes below the waterline is a subject of some debate. I have given my advice. Drilling larger holes into fiberglass and replacing it with fiberglass/epoxy is redundant. Sealing any hole and mantantence is Key. You dont need a sandwich of cutting boards or wood between your mounts .. you Need proper Bedding. You can shoot down my other post if you like .. but Im sure I was spot on about How to Do This .. Both ways. YD -So while you complain about someone else shooting down your post, you shoot down mine? The only reason I used a "sandwich of cutting boards" is because the only available cutting board at my local walmart was only 1/4" thick - too thin for the 1" mounting screws for the transducer - hence the "sandwich". The point is I needed something thick enough to screw the transducer into. I should have explained that better in my initial post. I agree that mounting the transducer plate directly to the transom with epoxy or 5200 COULD work, however not all transducer mounts, such as mine, have the appropriate surface area to get a good bond. Mine has a frame and is completely open in some spots, hence the need to be able to screw that into something solid which has an appropriate amount of surface area such as the poly cutting board. That poly will last way longer than wood and way longer than the boat or anything in it for that matter. I suppose we can all agree that there are SEVERAL RELIABLE ways to do what the OP wants. No .. I suggested that anyone that would consider shooting down my post is welcome .. because I am Right on this. All Im saying is this is too much of an approach to bed the ducer down correctly. I never gunned your post.. go ahead and gun mine down. You will not be able to. The OP can do what he wishes form the information given herein .. I give a step bye Step guide on How to do this. .. What do you give me ? .. Sarcasm and Bashing toward yourself. I give Information.. That is all I give. What I have said in the post above yours is Correct .. you can state your reasoning behind that. Im not here to be little anyone. Not you or anyone else. .. but I can say for sure How to do this in Anyway.